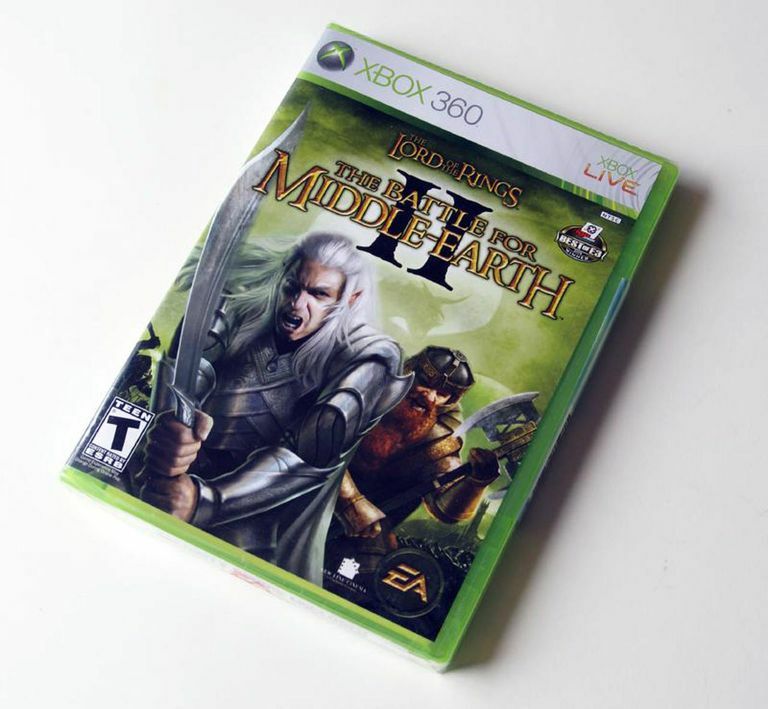 The Lord of the Rings: Battle for Middle Earth II is a real-time strategy video game for the Xbox 360 and is based on the Lord of the Rings and The Hobbit fantasy novels by J.R.R. Tolkien. It is also the follow-up game to The Lord of the Rings: Battle Of Middle Earth. Check out these cheat codes for the Xbox 360 version of the game. Win 10 capture and hold games. Finish the whole good campaign. Win 10 resource race games. Win 10 hero vs. hero games. Win 10 king of the hill games. Finish the first level of good campaign with all bonus objectives. Finish level eight of good campaign with all bonus objectives. Finish level one of bad campaign with all bonus objectives. Finish level four of the good campaign with all bonus objectives. Finish the good campaign with no heroes dying. Finish level eight of the bad campaign with all bonus objectives. Finish level four of the bad campaign with all bonus objectives. complete the whole bad campaign. Finish the evil campaign with no heroes dying. All maps in Skirmish and multi-player mode have Gollum cloaked on it. When you find Gollum, kill him and you will get the ring. Take it back to your fortress and have the troop that is carrying the ring enter the fortress in order to recruit a Ring Hero for 9,000 resources. The Ring Hero does not use any command points. Men, Elves, and Dwarves can recruit Galadriel. Mordor, Isengard, and Goblins can recruit Sauron. The easiest way to get the ring is to let an enemy find Gollum then kill them after they obtain the ring. The only way to stop them before they reach their base is to chase them down with a mounted unit, have a created hero teleport into their path, or to summon allies into their path using a power. Do not just rush your opponent's territory. Either send in a camo capable unit or a very cheap, weak unit such as Orc Warriors. Check out your opponent's base before attacking with stronger units. When attacking, use melee soldiers to attack buildings and use Bowmen and Cavalry on enemy units. Have a lot of defensive structures in your base and teleport the opponents to your base. The towers should kill the enemies before they can do much damage. The Convert spell will also work because they are free men. The following Xbox 360 achievements can be earned in Lord of the Rings: Battle for Middle Earth II. Note: General hints and tips are on the previous page. Complete Good Rivendell with all bonus objectives (Level 1) Unlocks Hero: Hadhod - 5 points. Complete Good High Pass with all bonus objectives (Level 2) - 5 points. Complete Good Ettenmoors with all bonus objectives (Level 3) - 10 points. Complete Good Blue Mountains with all bonus objectives (Level 4) Unlocks Hero: Maur - 10 points. Complete Good Grey Havens with all bonus objectives (Level 5) - 10 points. Complete Good Celduin with all bonus objectives (Level 6) - 15 points. Complete Good Erebor with all bonus objectives (Level 7) - 20 points. Complete Good Dol Guldur with all bonus objectives (Level 8) Unlocks Hero: Idrial - 30 points. Complete Evil Lorien with all bonus objectives (Level 1) Unlocks Hero: Krashnak - 5 points. Complete Evil Grey Havens with all bonus objectives (Level 2) - 5 points. Complete Evil Shire with all bonus objectives (Level 3) - 10 points. Complete Evil Fornost with all bonus objectives (Level 4) Unlocks Hero: Thrugg - 10 points. Complete Evil Mirkwood with all bonus objectives (Level 5) - 10 points. Complete Evil Withered Heath with all bonus objectives (Level 6) - 15 points. Complete Evil Erebor with all bonus objectives (Level 7) - 20 points. Complete Evil Rivendell with all bonus objectives (Level 8) Unlocks Hero: Olog - 30 points. Purchase first player power. - 5 points. Complete Good Campaign Unlocks Hero: Berethor - 25 points. Complete Evil Campaign Unlocks Hero: Tumna - 25 points. Complete Good Campaign without a Hero dying Hero: Mektar - 80 points. Complete Evil Campaign without a Hero dying Hero: Urulooke - 80 points. Win 1 Versus game. - 15 points. Win 1 King of the Hill game. - 15 points. Win 1 Capture and Hold game. - 15 points. Win 1 Resource Race game. - 15 points. Win 1 Hero Vs Hero game. - 15 points. Win 10 Versus games. Unlocks Hero: Ohta - 30 points. Win 10 King of the Hill games. Unlocks Hero: Fhaleen - 30 points. Win 10 Capture and Hold games.Unlocks Hero: Avatan - 30 points. Win 10 Resource Race games. Unlocks Hero: Celebrim - 30 points. Win 10 Hero Vs Hero games. Unlocks Hero: Felek - 30 points. Win 1 Single Player Skirmish game. - 5 points. Win a game against someone 20 places higher than you. - 50 points. Lose 10 Multiplayer matches in a row. - 0 points. Lose to someone ranked 20 places below you. - 0 points.